Ladyblush: Go vintage with your hair ! - finger waves ..
Want those beautiful ridges and waves for your special event? Try our directions, and get the perfect look you're after. Shorter hair, but it can be done with long hair, with accommodations. Straight or wavy hair. Curly hair should be straightened first. Lots of time - if you are doing your curls for an event, practice beforehand! Finger waves take time and experience to do, so don't try doing this even the day before. Give yourself several tries, minimum, so that you have the process down. Read the instructions throroughly, and try the technique on dry hair first, to get the feel for what you'll be doing. Lack of practice beforehand could mean that your hair will dry out before it should, and you'll have to start over. Get the feel for what you're doing before you wet your hair. 1. Start with wet hair. Your hair should be wet through and through, but not so wet that you are dripping everywhere. If your hair is too wet, gel will drip off too, and you will be one huge dripping mess! Just wet your hair thoroughly, towel it enough to keep it from dripping, and you're ready to go. 2. Apply a liberal amount of hair gel to your hair - enough to be able to shape with, but not enough that you are dripping in the stuff (see above). 3. Now that your hair is ready, study your head. Consider where you want to start. 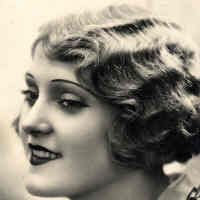 Most styles of the 20s were parted on the side, and if this is the look you are going for, all you need to do is decide which side you're going to part on. 4. Now, grab your comb and comb the hair straight out, placing the index finger of your left hand onto the side of the head, about an inch from the part. 5. Hold the hair firmly down with your index finger while you comb forward. You should see a ridge where your finger is. Hold the ridge in place by placing your middle finger next to the index finger, and place the comb flat against your head. 6. Comb straight down from the ridge, then pull it over , working your index finger against the ridge and the comb. Do not push the comb up! 7. You should now be seeing both the ridge, and the beginning of the wave. Start the second wave an inch to an inch and a half from the first one, working from the crown downward. Put longer hair into a bun, and fingerwave only around the head. Drape longer hair to the side, a la Veronica Lake. 9. When your waves are dry, comb them out carefully, and add a layer of hairspray.